Interested people are welcomed to see This Baby. We named? her GrandCafe Mavi , this one appears to be bigger( previous one was named Cafe Mavi)? Attached are some pictures of previous one (Cafe Mavi) and new Grand Cafe Mavi, It looks good so far. Nice, how old are they? fzeren at aol.com wrote: Interested people are welcomed to see This Baby. Just a quick note of sincere congratulations on this fantastic sucess. 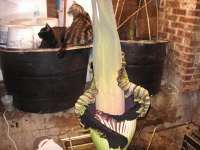 I would guess that most on this list will recognize that these sucesses did NOT come easy, and you must be a VERY devoted grower to get these generally difficult plants not only to grow, but also to bloom in the confines of a basement! Enjoy the fruits of this wonderful sucess! Perhaps later on you will share your methods of cultivating these ''monsters'' in the confines of a sunless basement---the lights used, methods of keeping the humidity high, fertilization, etc. come to mind as questions that might be asked! >> Interested people are welcomed to see This Baby. > Attached are some pictures of previous one (Cafe Mavi) and new Grand Cafe Mavi, It looks good so far. > Get the MapQuest Toolbar, Maps, Traffic, Directions & More! > to mind as questions that might be asked! >>> Interested people are welcomed to see This Baby. >> Grand Cafe Mavi, It looks good so far. >> Get the MapQuest Toolbar, Maps, Traffic, Directions & More! 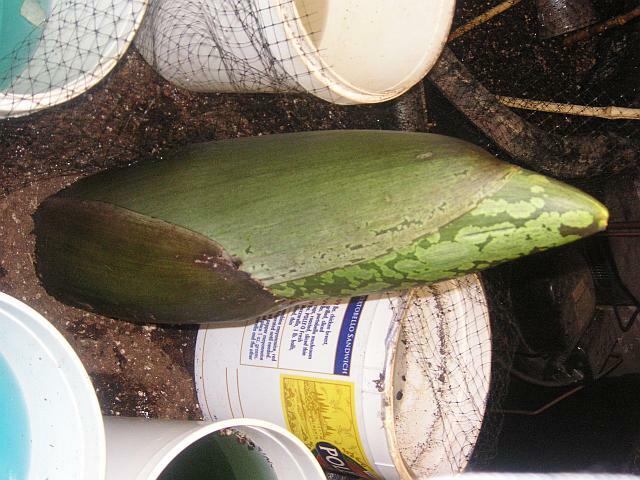 I guess, If I suggest one important tip that would be> keep an electrical heater blowing onto pot of the tuber ( put also water pots for humidity)?Or keep the pot around 85 F constantly.? Dont let the temperature of the?of the pot fluctuates. my first tuber? bloomed was 51 lb?. repot them at this point? or should I wait? > bloomed was 51 lb . > > this wonderful sucess! > > to mind as questions that might be asked! > >>> Interested people are welcomed to see This Baby. > >> Grand Cafe Mavi, It looks good so far. > >> Get the MapQuest Toolbar, Maps, Traffic, Directions & More! It would be so helpful if you would be so kind as to let us growers know what type of lighting, heat, fertilizer, keeping the humidity high, etc. 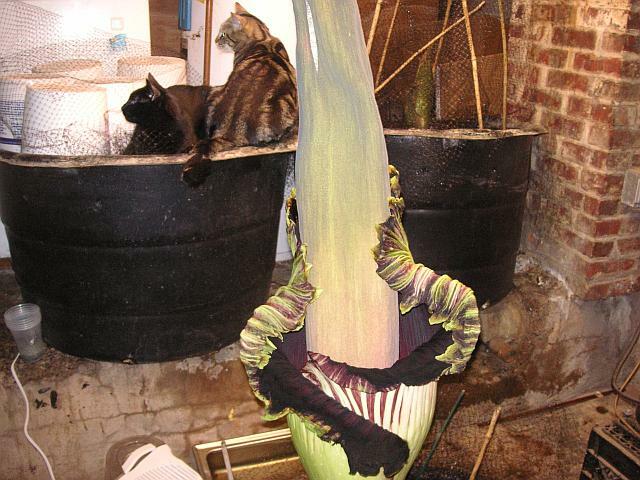 you used in growing these magnificent plants and then getting them to bloom in your basement! 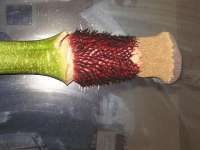 There are many growers ''out there'' who have spent a considerable sum on purchasing this and other species of Amorphophallus and who are growing these somewhat difficult plants under lights, so any tips from you would be very valuable. Again, congrats, and good growing!! >>>I guess, If I suggest one important tip that would be> keep an electrical heater blowing onto pot of the tuber ( put also water pots for humidity) Or keep the pot around 85 F constantly. Dont let the temperature of the of the pot fluctuates. my first tuber bloomed was 51 lb . >> to mind as questions that might be asked! >>>> Interested people are welcomed to see This Baby. >>> Grand Cafe Mavi, It looks good so far. >>> Get the MapQuest Toolbar, Maps, Traffic, Directions & More! You can re? pot anytime (make sure keep original soil together). When you take them out, dont expose to direct sun light. ?? ? ? ? ? Thanks! I've recently purchased a few :) Titanums and have them in my boiler room (the hottest part of my house) with a bucket of water for humidity. I was thinking of moving them out to another room come May. Put them on a heat mat and also they will be able to get some natural light there. My "guys" are only 1/2 inch thick at the base of the leaf structure (they have a ways to go) and came to me potted in a 4" square pot. I was thinking that they should be up potted since some have roots coming out the bottom. Can you repot them at this point? or should I wait?? ?? ? ? ? ? ?? How high is the ceiling in your basement? 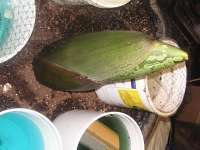 > You can re pot anytime (make sure keep original soil together). > When you take them out, dont expose to direct sun light. > you repot them at this point? or should I wait? 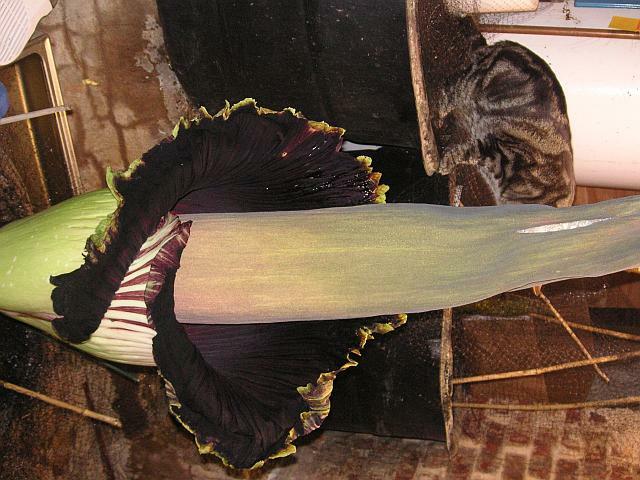 >> bloomed was 51 lb . >> > this wonderful sucess! >> > used, methods of keeping the humidity high, fertilization, etc. >> > to mind as questions that might be asked! >> >>> Interested people are welcomed to see This Baby. >> >> Grand Cafe Mavi, It looks good so far. >> >> Get the MapQuest Toolbar, Maps, Traffic, Directions & More! > Plan your next roadtrip with MapQuest.com: America's #1 Mapping Site. The ceiling is around 8-10 ft? (low). When the first one bloomed, the tip (i.e., spadix) was 4 or 5 inch below the ceiling. The new one appears to be bigger, will replace the pot location. Plan your next roadtrip with MapQuest.com: America's #1 Mapping Site. The flower just fits, but where did you fit the leaf?? You can re pot anytime (make sure keep original soil together). Thanks! I've recently purchased a few :) Titanums and have them in my boiler room (the hottest part of my house) with a bucket of water for humidity. I was thinking of moving them out to another room come May. Put them on a heat mat and also they will be able to get some natural light there. My "guys" are only 1/2 inch thick at the base of the leaf structure (they have a ways to go) and came to me potted in a 4" square pot. I was thinking that they should be up potted since some have roots coming out the bottom. Can you repot them at this point? or should I wait? I guess, If I suggest one important tip that would be> keep an electrical heater blowing onto pot of the tuber ( put also water pots for humidity) Or keep the pot around 85 F constantly. Dont let the temperature of the of the pot fluctuates. my first tuber bloomed was 51 lb . The flower just fits, but?where did you fit the leaf? ?